For a permanent orchard, the trees are best spaced 40 ft (12 m) apart each way. In India, a 30 ft spacing is considered adequate, probably because the drier climate limits the overall growth. Portions of the tree shaded by other trees will not bear fruit. For maximum productivity, there must be full exposure to light on all sides. In the Cook Islands, the trees are planted on a 40 x 20 ft (12 x 6 m) spacing-56 trees per acre (134 per ha)-but in the 15th year, the plantation is thinned to 40 x 40 ft (12 x l2 m). Young trees benefit greatly by wind protection. This can be provided by placing stakes around each small tree and stretching cloth around them as a windscreen. In very windy locations, the entire plantation may be protected by trees planted as windbreaks but these should not be so close as to shade the lychees. The lychee tree is structurally highly wind-resistant, having withstood typhoons, but shelter may be needed to safeguard the crop. 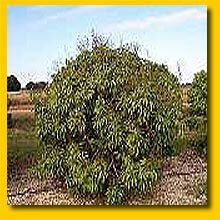 During dry, hot months, lychee trees of any age will benefit from overhead sprinkling; they are seriously retarded by water stress. Newly planted trees must be watered but not fertilized beyond the enrichment of the hole well in advance of planting. In China, lychee trees are fertilized only twice a year and only organic material is used, principally night soil, sometimes with the addition of soybean or peanut residue after oil extraction, or mud from canals and fish ponds. There is no great emphasis on fertilization in India. It has been established that a harvest of 1,000 lbs (454.5 kg) removes approximately 3 lbs (1,361 g) K2O, 1 lb (454 g) P2O5, 1 lb (454 g) N, 3/4 lb (340 g) CaO, and 1/2 lb (228 g) MgO from the soil. It is judged, therefore, that applications of potash, phosphate, lime and magnesium should be made to restore these elements. Fertilizer experiments on fine sand in central Florida have shown that medium rates of N (either sulfate of ammonia or ammonium nitrate), P2O5, K2O, and MgO, together with one application of dolomite limestone at 2 tons/acre (4.8 tons/ha) are beneficial in counteracting chlorosis and promoting growth, flowering and fruit-set and reducing early fruit shedding. Excessive use of nitrogen suppresses growth and interferes with the uptake of other nutrients. If vegetative dormancy is to be encouraged in bearing trees, fertilizer should be withheld in fall and early winter. In limestone soil, it may be necessary to spread chelated iron 2 or 3 times a year to avoid chlorosis. Zinc deficiency is evidenced by bronzing of the leaves. It is corrected by a foliar spray of 8 lbs (3.5 kg) zinc sulphate and 4 lbs (1.8 kg) hydrated lime in 48 qts (45 liters) of water. Because of the very shallow root system of the lychee, a surface mulch is very beneficial in hot weather. Ordinarily, the tree is not pruned after the judicious shaping of the young plant, because the clipping off of a branch tip with each cluster of fruits is sufficient to promote new growth for the next crop. Severe pruning of old trees may be done to increase fruit size and yield for at least a few years. 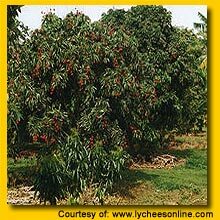 The Indian farmer may girdle the branches or trunk of his lychee trees in September to enhance flowering and fruiting. Tests on 'Brewster' in Hawaii confirmed the much higher yield obtained from branches girdled in September. Girdling of trees that begin to flush in October and November is ineffective. Similar trials in Florida showed increased yield of trees that had poor crops the previous year, but there was no significant increase in trees that had been heavy bearers. Furthermore, many branches were weakened or killed by girdling. Repeated girdling as a regular practice would probably seriously interfere with overall growth and productivity. Indian horticulturists warn that girdling in alternate years, or girdling just half of the tree, may be preferable to annual girdling and that, in any case, heavy fertilization and irrigation should precede girdling. Fall spraying of growth inhibitors has not been found to increase yields.